This original rag rug headband is only rag rugged in the traditional shaggy technique, using a mixture of plain and patterned cottons. It even has the odd few pieces of beautiful Liberty print included! 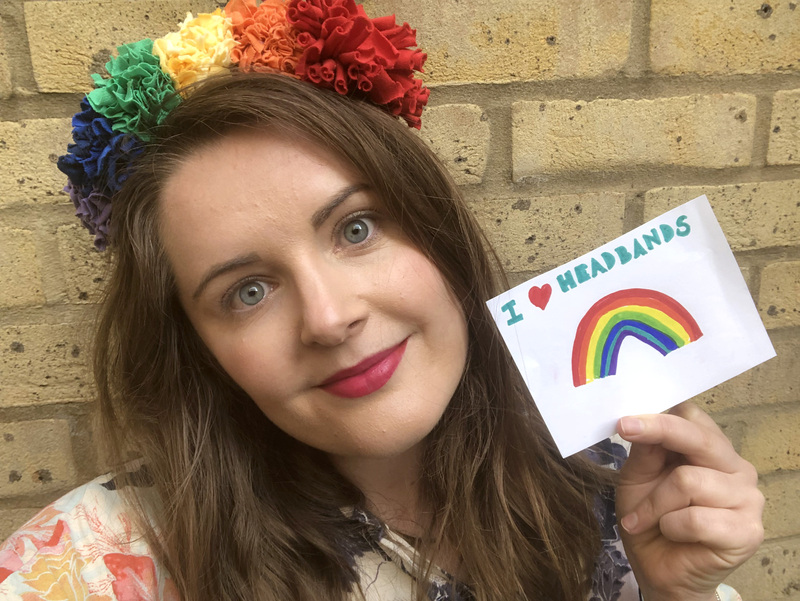 These jolly rainbow headbands are bound to bring a smile to your face. The astute amongst you may notice that the two headbands are slightly different. The top headband has a longer section of red rag rugging on the far right, where as the second headband is completely rag rugged using the same length pieces. Both look great and I’d be proud to rock either to Pride. 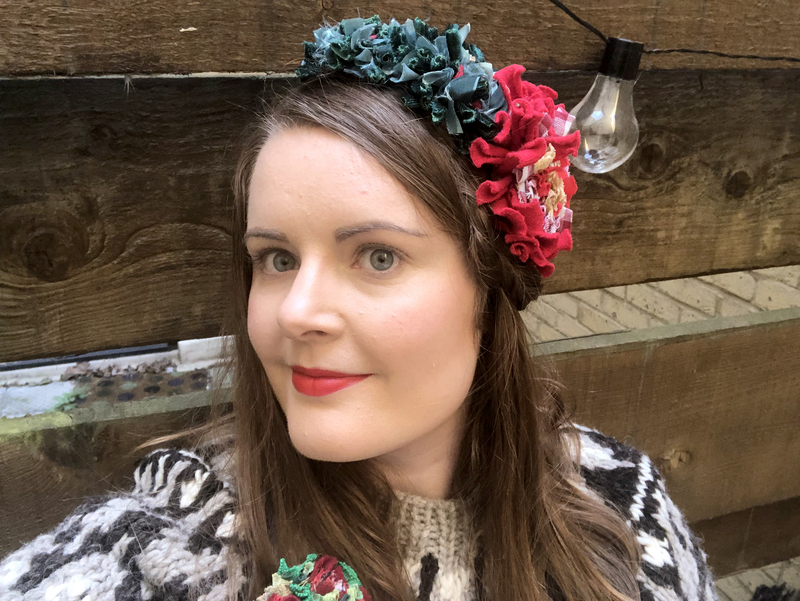 I’m a sucker for a good seasonal make, so it got me thinking whether we could achieve a Christmas-inspired headband. This is the end result. The red flower is supposed to represent a poinsettia, whilst the green is holly with the odd berry in. I was particularly pleased by how the green velour caught the light and tubed up to create gorgeous texture. Here you can see the little berries in the “holly” of the headband. 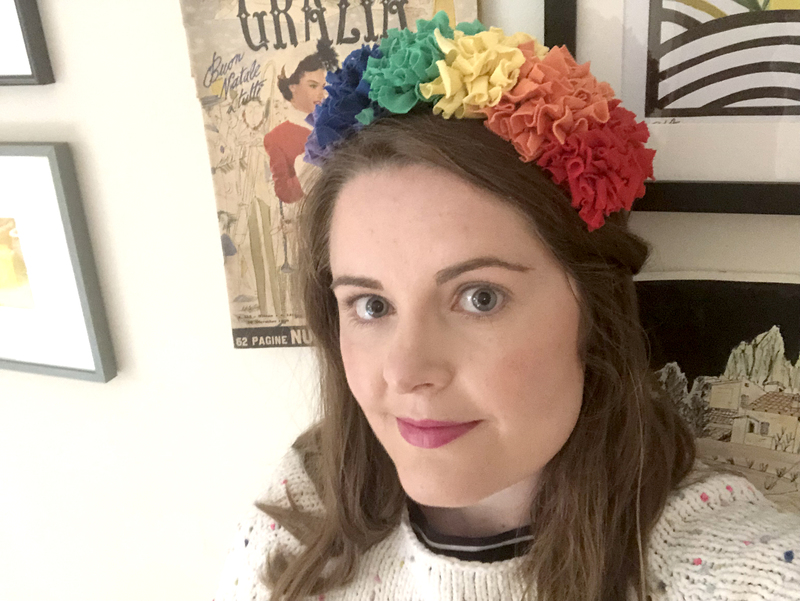 There’s still some work to be done on this one, but we wanted to see whether you could create a sort of bohemian bridal-style flower crown using floaty, longer pieces of fabric. I’m not sure that we quite nailed the colour combo (although it goes quite nicely with my dress), but I think it shows a lot of promise and you can watch this space for further creations. I don’t know why, but this felt like a lying down photography opportunity. Here you can see the flower in the centre of the crown a little bit better. 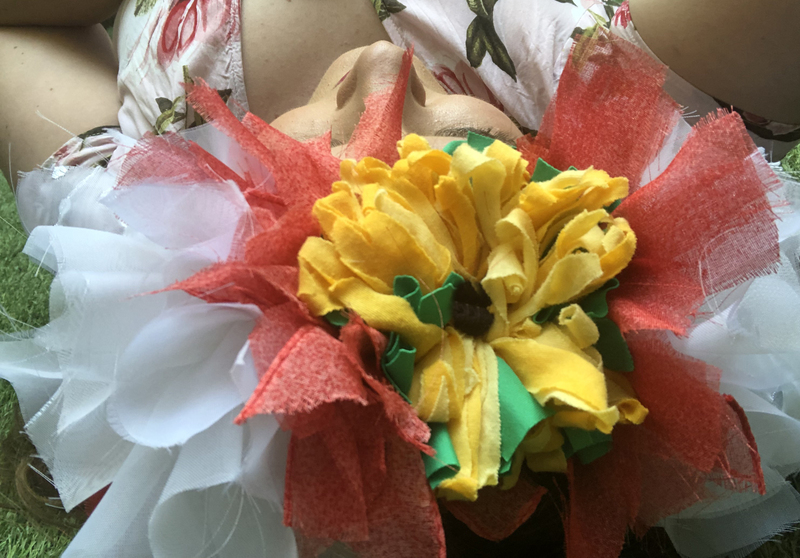 We used a little bit of loopy rag rugging in the centre of the flower to create contrast, although it did get a bit swamped by the shaggy pieces. 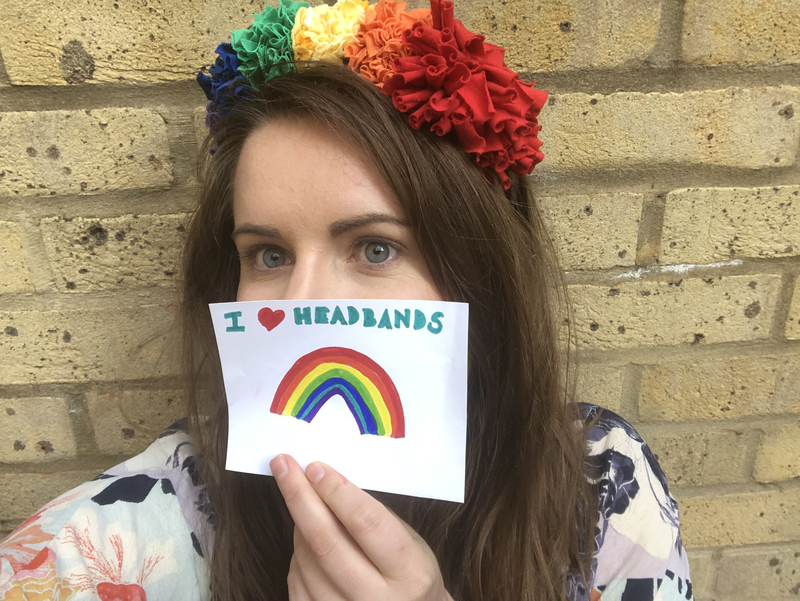 Right, those are a few of the headbands that we’ve made so far, but why have I absolutely fallen in love with this project? 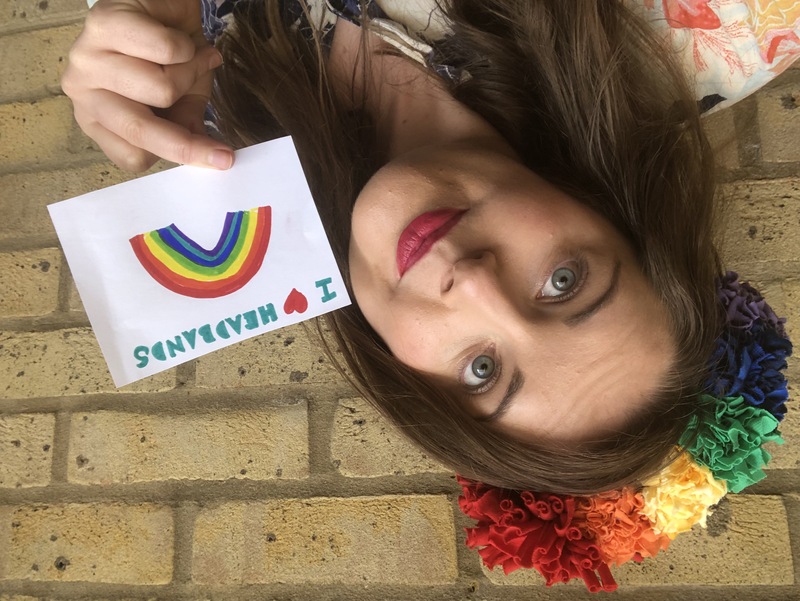 What makes rag rug headbands so great? They’re easy to make. All you need to know is the basic shaggy rag rug technique, which is the easiest technique to master. See it in action here. They’re quick to make. 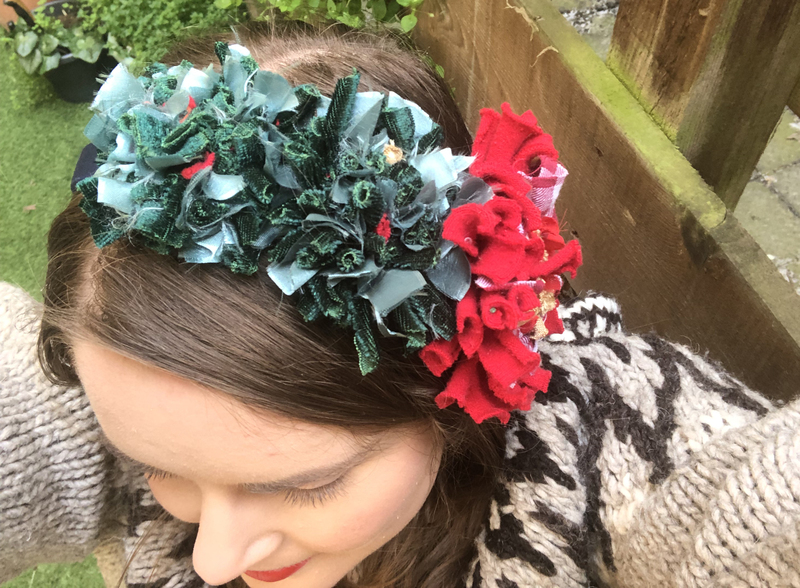 Like our rag rug bouquets, our rag rug headbands don’t take all that long to make. You can knock one out in an evening, and you can even watch TV while doing it. They are guaranteed to put a smile on your face. 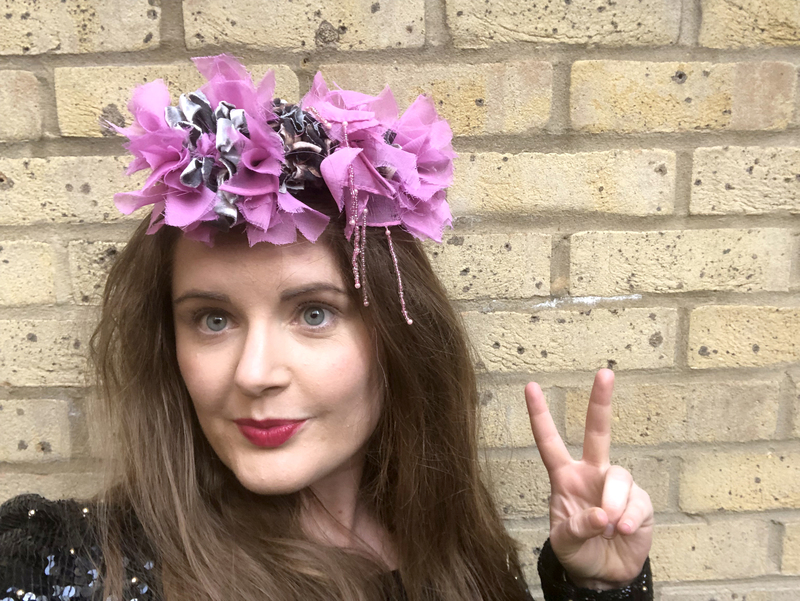 Whether you’re making one for a wedding (alternative fascinator anyone? 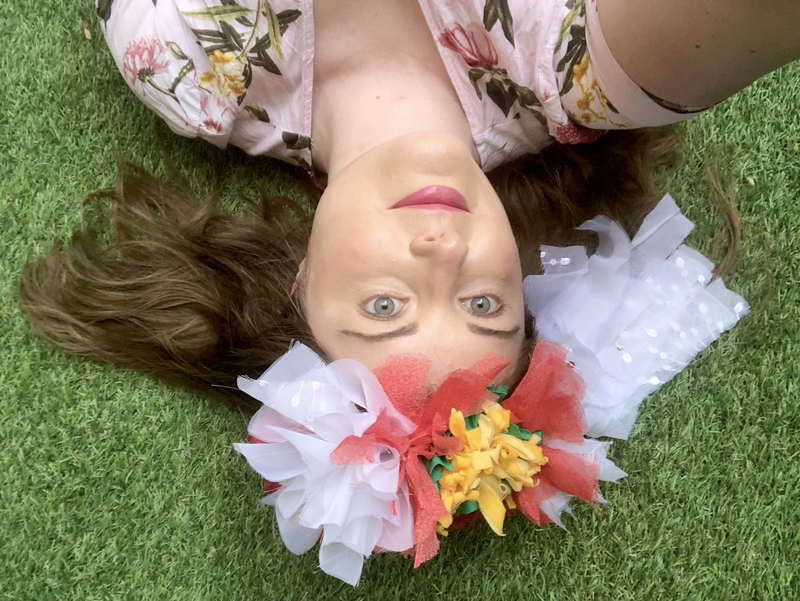 ), a music festival, just to inject a bit of colour into your outfit or for the love of rag rugging, what we’ve discovered is that rag rug headbands are just SO MUCH FUN! Right, so how can you make one? As with all our other classic Ragged Life projects, we like to sell new projects as both a kit (with all the tools necessary for a complete rag rug beginner), as well as a hessian pack (with the hessian and project-specific materials, but no general rag rug tools). 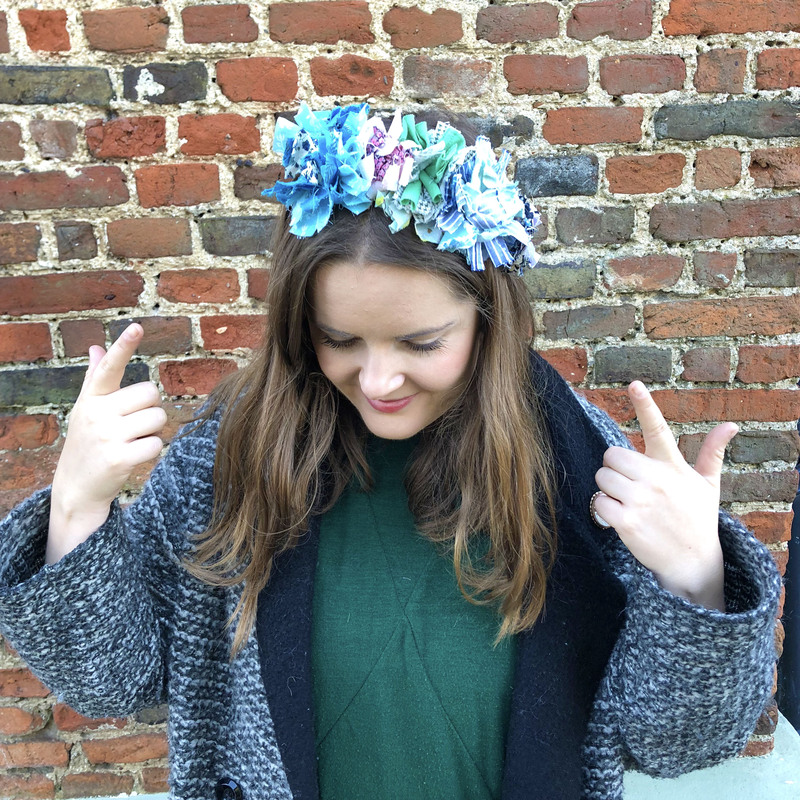 Click below to pre-order your Rag Rug Headband Kit or Rag Rug Hessian Pack today. Each set makes three rag rug headbands, so you’ll have one for every occasion. The first kits will be sent out 8th May, 2019 (when I’m back from holiday in Australia). Thanks for your patience. Can’t wait to see what you make!!! Right, that’s it for the time-being where headbands are concerned. 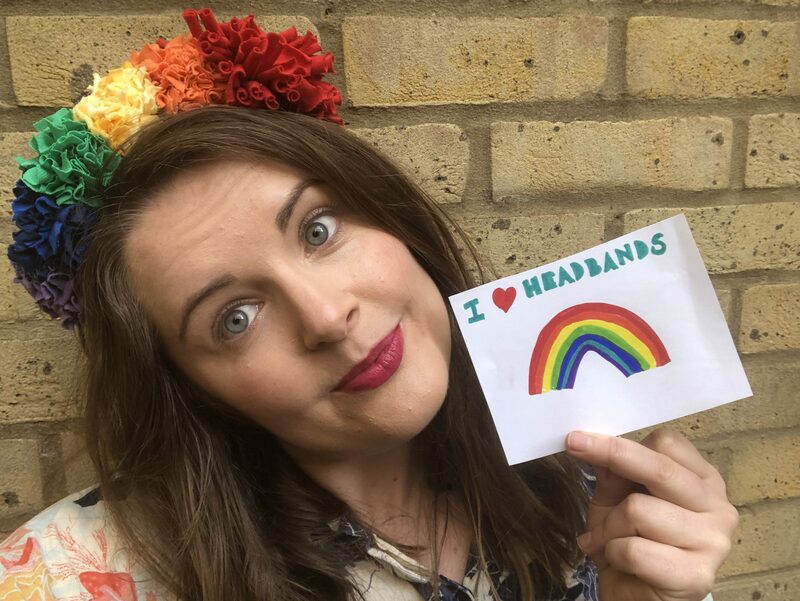 Place your pre-order today and be the first to be rocking a snazzy headband like mine. If you’d like to be the first to hear about new rag rug projects, why not join our Rag Rug Community on Facebook or join our fortnightly newsletter here. This entry was posted in Inspiration, Rag Rug Designs and tagged 2019, Fashion, Shaggy. Bookmark the permalink.